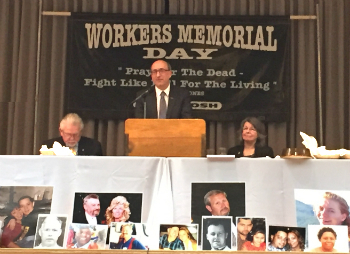 OSHA Assistant Secretary Dr. David Michaels delivers a Workers Memorial Day address in Philadelphia, surrounded by photographs of fallen workers and the loved ones they left behind. Every year more than 4,800 workers go to work and never return home as a result of entirely preventable workplace incidents and another 50,000 workers die from preventable work-related diseases. To remember and honor these workers, OSHA, unions, family members, workers and employers come together each year on April 28 to commemorate Workers Memorial Day. "Tomorrow and every day thereafter, in honor of those we have lost, we will fight to make sure that every American worker is protected against the myriad of hazards out there affecting their safety, their health, their lives and the security of their families," said OSHA Assistant Secretary Dr. David Michaels. 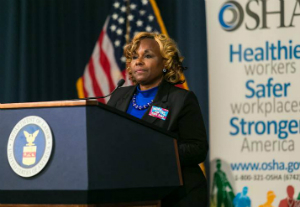 At the OSHA event held in Washington, D.C., Emergency Response Team Coordinator Duronda Pope described her experiences helping the families of workers killed on the job. 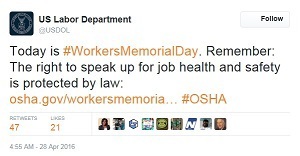 Workers Memorial Day was recognized by President Obama in a presidential proclamation issued April 28 and OSHA hosted an event marking the occasion at the U.S. Department of Labor headquarters in Washington, D.C. The program included remarks from Deputy Secretary Chris Lu, OSHA Assistant Secretary Dr. David Michaels, MSHA Assistant Secretary Joe Main, AFL-CIO Safety and Health Director Peg Seminario, United Steelworkers Safety and Health Director Mike Wright, and Duronda Pope from the United Steelworkers' Emergency Response Team. This was just one of the many events commemorating Workers Memorial Day held across the country throughout the week, where participants rededicated themselves to the mission of preventing workplace injuries, illnesses, and deaths. To learn more, visit the Workers Memorial Day webpage. 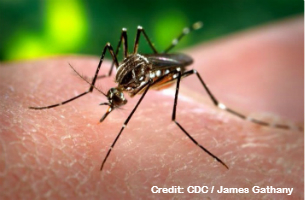 An outbreak of Zika is spreading through Central and South America, Mexico, and parts of the Caribbean, including U.S. territories. Though Zika currently isn't spreading on the mainland through mosquitoes—the main route of transmission of the virus—employers and workers should take steps to prevent or minimize the risk of Zika infection if transmission starts to occur or if they work with travelers returning to the U.S. with Zika. An OSHA and NIOSH interim guidance* provides recommendations on protecting workers who may be at risk for Zika virus infection through on-the-job exposure to mosquitoes or the blood or other body fluids of infected individuals. Visit OSHA's Zika webpage for more information. Responding to a complaint, OSHA inspected the Houston worksite of Alfa Laval Inc. in October 2015. OSHA cited the global technologies manufacturer for eight serious, three repeated and two other violations. The repeated citations were for exposing workers to struck-by and amputation hazards by failing to implement an energy control program that included training, procedures or periodic inspections. The same or similar violations were cited in an August 2011 inspection at Alfa Laval’s facility in Lykens, Pa., and in a May 2012 inspection at the company’s facility in Wood Dale, Ill. For more information, read the news release. Two times in three days, OSHA inspectors witnessed Premier Roofing Company LLC and its sub-contractor Walter Construction LTD exposing workers to falls. In December 2015, OSHA responded after receiving a complaint about workers in danger of falling as they installed shingles on a three-story building. Two days later, investigators returned and found workers still exposed to the same hazards. As a result, OSHA cited Premier Roofing – the controlling employer – for two violations for exposing workers to fall hazards repeatedly and five serious violations for not protecting workers from head and eye hazards; and raising workers to the roof on a platform without rails atop a forklift. Walter Construction was cited for seven serious violations, including not protecting workers from head and eye hazards, and not training workers on hazards with scaffolds. For more information, read the news release. A Wisconsin food cannery faces $143,550 in penalties after a 35-year-old worker fell more than 17 feet into an empty sauerkraut vat and broke multiple bones. The inspection that followed is the fourth time since 2011 that OSHA has cited GLK Foods LLC for failing to protect workers from fall and machine hazards. OSHA most recently issued safety violations following an October 2015 injury inspection at the canner in Bear Creek. OSHA found similar violations at the facility in 2013 and 2015. In this latest inspection, OSHA found GLK Foods failed to: protect workers from falls; implement permit confined space requirements; install safeguards on moving conveyor parts; keep floor holes covered to prevent slips and falls; and use locking devices to prevent unintentional operation of conveyors. For more information, read the news release. OSHA cited Owen-Ames-Kimball and Stevens and Layton Inc. for serious safety violations at a utility line installation site in Port Charlotte, Fla. Proposed fines total $107,400. The agency initiated the inspection after receiving a report of workers in a trench without protection. Both companies were cited for not using sloping or bracing to prevent soil from collapsing into the excavation and placing the removed soil too close to the opening. Stevens and Layton was cited for willfully disregarding these safety requirements as well as for not training workers to recognize and avoid cave-in hazards and not providing a safe means to enter and exit the excavation. "OSHA is concerned about the nonchalant attitude toward worker safety Stevens and Layton displayed," said Les Grove, OSHA's area director in Tampa. "There is no such thing as 'safe enough' when it comes to not meeting federal safety standards." Stevens and Layton was previously cited in 2005 for excavation violations. Since 2006, Owen-Ames-Kimball has been inspected 67 times in Michigan and has received 36 citations. For more information, see the news release. Two employers were recently cited by OSHA in unrelated incidents for failing to properly protect their employees from the threat of workplace violence. OSHA cited Jay Management Inc. for a general duty clause violation after a worker at a convenience store in Irvington, N.J., was fatally shot during a robbery. "In the past five years, 20 workplace violence incidents involving theft, armed robbery and fights occurred at this store," said Kris Hoffman, OSHA's area director in Parsippany. "Jay Management was well aware of this history and, even after the death of its employee in October the employer did nothing to implement safety measures to protect employees." For more information, see the news brief. In another incident, OSHA cited Integrated Life Choices Inc., which cares for developmentally challenged persons, with a general duty clause violation for exposing employees to workplace violence hazards at its facility in Lincoln, Neb. The citation was issued after a pregnant worker who was bit and kicked by a client had to be hospitalized due to her injuries. Integrated Life Choices was also cited for failing to notify OSHA of the worker's hospitalization within 24 hours, as required by the agency's injury reporting regulation. California OSHA issued citations and $72,735 in fines to DP Investments in Santa Barbara after the employer violated a stop-work order that inspectors had placed on dangerous scaffolding. The scaffolding lacked a ladder for safe access, a guardrail to prevent falls and base plates to provide a firm foundation. A follow-up inspection revealed that the stop-work order had been removed from the scaffolding without permission and that employees had resumed working on the structure without any safety modifications. See the Cal/OSHA news release* for more information. Virginia Occupational Safety and Health issued $17,000 in fines to a Goodyear Tire and Rubber Company facility in Danville for serious workplace violations that resulted in the death of Jeanie Strader, an employee who had been with the company for 15 years. VOSH inspectors cited Goodyear because it failed to install proper guarding of floor and wall openings and ensure that machines were locked to prevent unexpected start up, or release of stored energy, during servicing and maintenance. Since August 2015, the Danville plant has experienced three fatal incidents and last month, a pipefitter was scalded by a mixture of steam and hot liquid. OSHA has published a final rule establishing procedures for handling retaliation complaints under the FDA Food Safety Modernization Act. The final rule explains the burdens of proof, remedies and statute of limitations similar to other whistleblower protection statutes and protects employees who disclose information about a possible violation of the Food, Drug and Cosmetic Act from retaliation of their employers. In 2014, OSHA published an interim final rule and requested public comments. This final rule responds to those comments, clarifies the agency's policy regarding approval of settlement agreements, and improves consistency with the language of the statute, other OSHA whistleblower regulations, and developments in applicable case law. For more information, see the news release. Secretary of Labor Thomas E. Perez has renewed until 2018 the charter for the Whistleblower Protection Advisory Committee so that it can continue to perform its duties under the Occupational Safety and Health Act of 1970. The committee was established to advise, consult with, and make recommendations to the Secretary and the Assistant Secretary for Ocupational Safety and Health on ways to improve the fairness, efficiency, effectiveness, and transparency of OSHA's administration of whistleblower protections. See the Federal Register notice for more information. OSHA and The Builders' Association renewed their 15-year partnership, continuing to focus on reducing injuries, illnesses and fatalities in the construction industry. The partnership impacts more than 800 union and non-union construction companies throughout Missouri, eastern Kansas and parts of Nebraska. Employers designated as "Build Safe Partnership Program" participants by the Builders' Association will be required to implement written safety and health programs, conduct training and job site inspections, and involve workers in weekly site safety meetings. OSHA will review these programs at least annually to track and compare information on injury and illness rates, share best practices and review goals. See the news release for more information. OSHA alliance participant Wisconsin Indianhead Technical College hosted its 7th Annual Safety Day* on April 12. Hands-on sessions included confined space rescue, load securement, and industrial hygiene ventilation survey. The more than 100 attendees chose diverse sessions such as arc flash, lockout/tagout, visual literacy, ergonomics, OSHA documentation, safety committees, and updates on OSHA regulations and initiatives. Examples of occupational noise exposure. The National Institute for Occupational Safety and Health released a study last month in its Morbidity and Mortality Weekly Report on hearing impairment among noise-exposed workers in the United States from 2003 to 2012. This study found a prevalence of 13 percent hearing loss (mild to complete) among 1.4 million audiograms studied. This study confirms and quantifies the prevalence of hearing loss among employees of nine major industry sectors. The mining, construction and manufacturing industries had the highest prevalence of workers with any hearing impairment or moderate to severe hearing impairment. Occupational hearing loss, primarily caused by high noise exposure, is the most common U.S. work-related illness. NIOSH estimates that 22 million U.S. workers are exposed to hazardous occupational noise. For more information, see OSHA's Occupational Noise Exposure webpage. 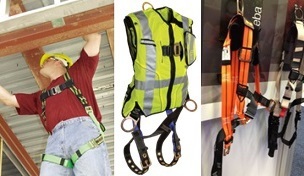 Body harnesses are used in personal fall protection systems. Workers need to be fitted with the correct harness size. OSHA has published a new chapter in the OSHA Technical Manual. Chapter 4, Section V, "Fall Protection in Construction," provides OSHA inspectors with technical information critical in evaluating fall hazards and abatement methods in the construction industry. This chapter includes key information on fall prevention, hazard assessment, and detailed images on protection equipment. 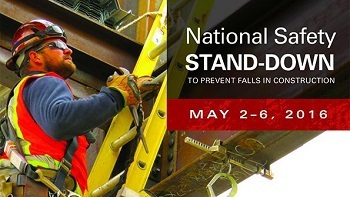 Because nearly half of all construction worker deaths are due to falls, OSHA is holding its third annual National Safety Stand-Down May 2-6. Three new fact sheets are available for free downloading from OSHA's Publications webpage. A ladder jack scaffolds fact sheet* illustrates how to prevent injuries from falls when using work platforms supported by portable ladders. A confined spaces fact sheet* emphasizes the OSHA requirement for employers to develop and implement procedures for summoning rescue or emergency services in permit-required confined spaces. Lastly, a fact sheet on longshoring in marine terminals* describes how to prevent semi-tractor driver injuries during container lifting operations. OSHA, the National Institute for Occupational Safety and Health and the Center for Construction Research and Training have developed a new series of infographics that illustrates the importance of preventing falls in construction. These infographics, available in both English and Spanish, raise awareness on fall hazards and resources for preventing them – including a ladder safety app. 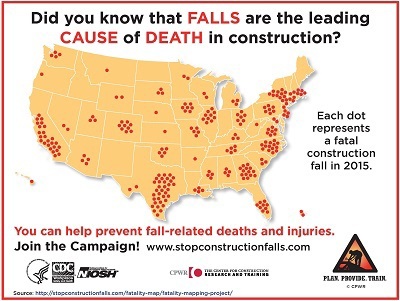 The infographics can be downloaded as PDFs or JPEGs for use in social media, presentations and print materials from stopconstructionfalls.com. National Safety Council offers free resources in "Journey to Safety Excellence"
The Journey to Safety Excellence website is a workplace advocacy initiative from the National Safety Council that provides with three measurement tools: a safety system assessment*, employee safety perception survey* and incident rate calculator*. Participants also gain access to hundreds of e-resources – including articles, recorded webinars, white papers and more – plus a Safety Forum to connect with experts and peers. The NSC will present a free webinar on May 24th at 2:00 CST explaining the benefits of the Journey.